When I was 2 years old, I was obsessed with teddy bears. I had tons of stuffed bears of all sizes and loved them all. Apparently, I loved teddy bears so much that I wanted a teddy bear-themed 3rd birthday party. Not one to shy away from themes, my mom went all out. I had a teddy bear cake, teddy bear plates, napkins, party favors, etc. I’m sure I also had all my stuffed bears attending the party as well. Probably in outfits, since that’s the kind of kid I was. See? I loved teddy bears. Anyway, since it was my 3rd birthday party and I was officially a Big Girl – I even had a little brother now! – my mom wanted to make the experience extra special. There was a surprise coming! In walked a giant singing bear! My mom looked at me expectantly, waiting to see my face light up with a huge grin. Instead, I crumbled into a pile of screams and tears. I guess my parents had the bear leave, simultaneously apologizing while trying to console their now shrieking 3 year-old. Needless to say, the “real life bear” was a bit much for me to handle. Fast forward 21 years and I’m about to turn 24. I’ve been at a new job for a few months and Twin had just begun working with me a few weeks earlier. 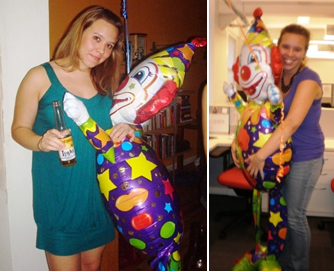 Since she was new to the office and since we have a habit of humiliating each other on our birthday’s – in as public of a way as possible – I had gotten her these two enormous clown balloons that she then had to carry home with her. On the subway. To Queens. There were two of these monsters. So, on the day of my 24th birthday, I’m a little apprehensive going into work. I arrive and my desk is empty. No giant balloons yet. As afternoon approaches, I’m a little on edge. And then it happens. While I may appear to be laughing, I'm actually shaking with terror and holding back tears. Four of my best friends had gotten me a singing telegram. In the form of a giant, hot pink, coconut-bra-and-tutu-wearing gorilla. And as Twin look at me expectantly, ready for my face to light up with laughter, I fought back tears. See, I don’t really remember my 3rd birthday party with the Giant Bear Fiasco, but that fear that was instilled in me back in 1987? That fear is still very much there. There’s a reason I hate the Times Square characters on the street. There’s a reason people in animal suits absolutely petrify me. I’d simply forgotten it was there – and of course I’d never mentioned it to my friends. I mean, how do you casually say, “By the way, I have an unreasonable yet paralyzing fear of people in animal costumes but I’m not totally sure why.”? After this harrowing experience – you can see my facial expressions were mangled with laughter and grins hiding my utter horror – I called my mom and explained what happened and the anxiety that plagued me. (I mean, I was shaking for hours after this). 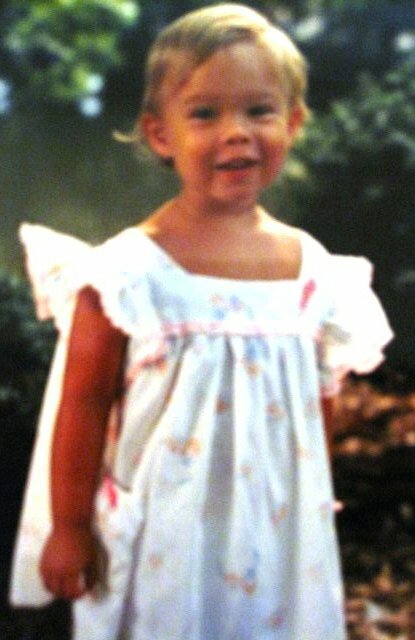 She simply burst out laughing and – albeit slightly guiltily – relayed to me the story of my 3rd birthday party.